By the death of General Scott-Elliot, in September 1996 at the age of 93, not only did the Country lose a distinguished soldier of the second World War, but this Society lost one of its more influential members. This is not the place to recite his military career, for which reference should be made to the Daily Telegraph of the 21st of that month, except to say that, as might be expected of an ex commander of the 51st (Highland) Division and former colonel of the Kings Own Scottish Borderers, he took a keen interest in the welfare of all old soldiers whom he met in Dumfries and Galloway of whatever rank, regiment or war. 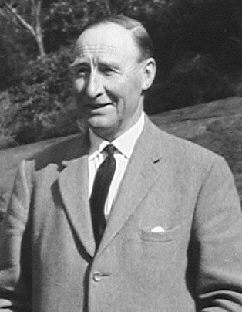 On retiral he came to reside at Glencaple and, following in the footsteps of his late uncle Professor George Scott-Elliot, joined our Society in 1957. After serving on the Council for several years he became President from 1962 to 1965. He appeared on the scene just when we were coming to terms with the loss of Dr.R.C.Reid whose influence and contacts had sustained the Society for many years. The General had a keen enquiring mind and was not satisfied until he found out for himself what an enigmatic feature in a field might be. Thus he became involved in a large patch of blackened and splintered stone at Townfoot, Glencaple which he later knew to have been a 'burnt mound' cooking (or bathing) site dating, in that case, to the bronze age. His earlier excavation at Whitestanes Moor on an unusual ring burial cairn was also successful pioneering work. His publications in the Transactions are listed below. In his later years he took up dowsing, first as an aid to archaeology, then as a fascinating subject in itself. He was President of the British Society of Dowsers from 1966 to 1975 and in 1977 wrote Dowsing: One Man's Way. However the principal legacy he left this Society was to maintain the status of our Transactions in the archaeological world by using his influence as President, from 1965 to 1967, of the Society of Antiquaries of Scotland (primed perhaps by Alfred Truckell) to cajole or persuade a series of valuable articles out of a number of budding young professional archaeologists. These started off, in No.42 our first new format volume, with papers on Food Vessels in SW Scotland by Derek Simpson and Bronze-Age Metalwork by John Coles, followed by Battle Axes, Neolithic Axes, Beaker Pottery, Cinerary Urns and others all well illustrated and definitive and invariably referred to today in articles and reports in archaeological journals. James Scott-Elliot's military, archaeological and historical papers (c. 1920–90) were presented to the National Library of Scotland under Accession No. 11499. Also presented to the National Library in 1993 (Accession No. 10831) were various family papers relating to James Scott-Elliot (d. 1880), Calcutta merchant, and of his sons Professor George Francis Scott-Elliot (1862–1934) and Lt-Col William Scott-Elliot, DSO (1873–1943).